OPIC launches two new projects in Ukraine. The US Government’s development finance institution Overseas Private Investment Corporation (OPIC) approved on 9 June the support of new development projects in Ukraine totalling nearly 72.5m dollars. In a release, OPIC said that up to 37.5 million dollars in financing will be allocated to Emerging Europe Growth Fund III L.P., a private equity fund launched by Horizon Capital Advisors, LLC. This fund seeks to invest in fast-growing, mid-sized, export-oriented companies in Ukraine and Moldova with the potential to grow from local to regional market leaders. Another 25m dollars in financing will go to Dragon Capital New Ukraine Fund L.P., a private equity fund managed by a subsidiary of Dragon Capital Holdings Limited. This fund is expected to have a significant developmental impact in Ukraine by investing in established Ukrainian businesses that are focused on product expansion, modernization, and growth potential in a wide range of sectors including agribusiness, healthcare, infrastructure, retail, consumer goods, and real estate. OPIC is the US Government’s development finance institution. It mobilizes private capital to help address critical development challenges and in doing so, advances US foreign policy and national security priorities. 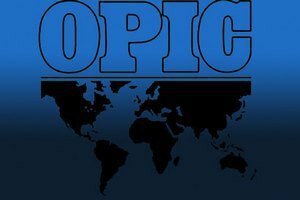 An important OPIC requirement is that its investment shall have "a meaningful connection to the U.S. private sector". For financing, this means a US-organized entity 25 percent or more U.S.-owned or a majority US-owned foreign organized entity or US citizens.